Gabe Kapler, the recently hired Director of Player Development for the Dodgers (check out my past story welcoming him to the team, here), is just starting to make his mark on the team. He'll be tasked with assisting our young farmhands as they rise up the ladder with an eye towards Los Angeles, and one of his goals will be to preach the gospel of healthy living and consistent work in the gym. As evidenced through a twitter exchange on New Year eve, Kapler is clearly ready to get to work. 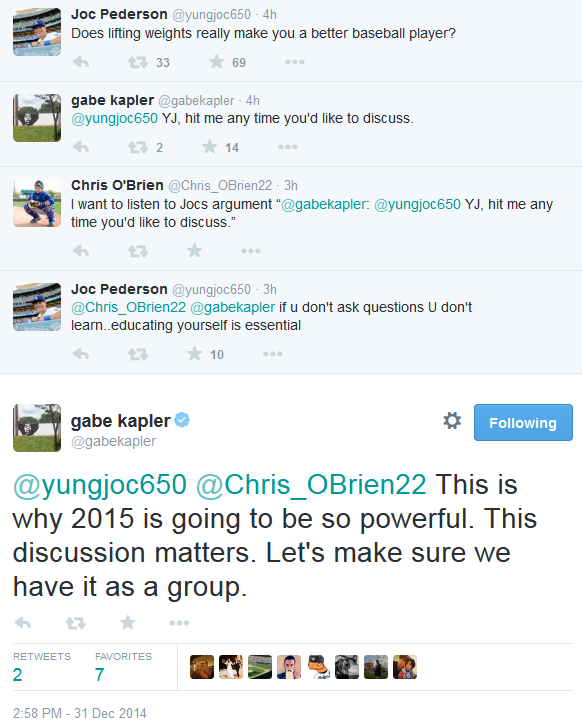 Check out the exchange between Joc Pederson and Gabe Kapler below. You gotta love that Kapler is ready to lend a hand, and it's even better to see that Pederson is ready to listen. BTW, this entire exchange had my brain thinking about a certain meme. Check out my creation below. UPDATE: I thought I'd add the following article written by Gabe Kapler on his website in early December. Via Gabe Kapler on his personal website Kaplifestyle, "Working Smart: Speed and Power." Gabe suggest that endurance training makes no sense for Baseball players.